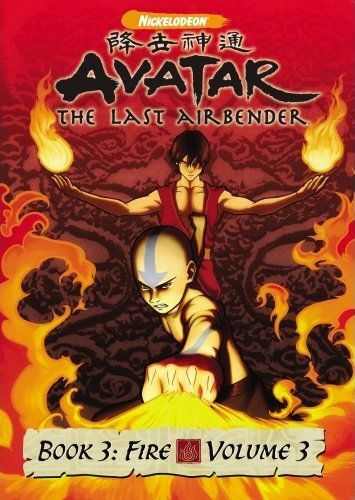 The first episode on Avatar: The Last Airbender - Book 3: Fire, Volume 3 is The Day of Black Sun, Part 2: The Eclipse , the conclusion to the attack on the Fire Nation. Aang, heads off to fight the Fire Lord, but finds the palace deserted. With time running out, he, Sokka, and Toph head off to search for a secret area where the Fire Lord may have fled... and thanks to Toph's amazing ability to see what others cannot, she finds exactly what their looking for in the form of a giant underground structure. So they head off in search of their foe, but unfortunately they encounter the masterful Princess Azula instead. Being unable to locate the Fire Lord in time, he and the rest of his Fire Benders regain their powers, causing the valiant assault to ultimately fail. Aang, Sokka, Katara, Toph, and a few other of the younger warriors are able to escape on Appa while everyone else is captured and sent to Fire Nation prisons. Not knowing where else to flee, the ragtag team heads to the Western Air Temple where they intend to lay low and come up with a new plan for defeating the Fire Nation. After mulling the situation over, Aang ultimately comes to the conclusion that he must continue his training; he must learn to master fire bending. Of course, in order to do that, he'll need to find a Fire Bending master to instruct him... which is not an easy feat seeing as how the Fire Nation is at war with the rest of the world, and Aang is wanted D-E-A-D by the Fire Lord. The last two episodes of the disc combine to form a two-parter, titled The Boiling Rock . Sokka learns from Aang's new Fire Bending teacher that the most likely place their captured allies were taken was to the maximum security prison The Boiling Rock. Located in the center of a volcano and surrounded by boiling hot water, no one has ever escaped from the fortress. But Sokka and Katara's father was one of the captured, and Sokka is determined to do whatever it takes to rescue him. Describing the stories just cannot do this show justice. Everything comes together so well that just makes this one of the best animated shows ever made. Every character is multidimensional; they grow, they learn, and they change. They have their individual personalities that shine through both dialogue and body language. And they are thrown into fully understandable situations, forced to make decisions that would not only affect their lives, but the lives of everyone they know. It is far from simple, but it also flows so well that the story never gets confused or bogged down in irrelevant side quests. I don't think anyone could ask for a better show. What I would love to ask for, however, is to be able to chapter skip past the opening of every episode. Why didn't they do this? It's the same opening every time! But instead of just hitting the chapter skip to get on with the show, I must either sit through it or fast forward. It's annoying! But that's the only gripe I have with the DVD release. Everything else is good; they fit five full episodes on a disc rather than 2, 3, or 4 like some other anime series. And there are always special features, even if sometimes they are pretty minor. This release gives us an audio commentary by the creators. Anyway, this is a no-brainer. Buy it!